Arnold Schwarzenegger has always been one of my favorite movie actors. Not only that, Arnold also serves as the role model and an inspiration to me that I’m able to achieve extraordinary results like he did. There is no doubt that he is one of the most inspirational characters to many, including myself. And in this article, you will discover the 17 most inspirational quotes from the man himself. Arnold started his weight training since the age of 15. When he saw the poster of Reg Park starring in the Hercules movie, he decided then he wanted to be like Park. He trained hard and his hard work paid off. Arnold won the Mr. Universe title at age 20 and went on to win the Mr. Olympia title for 7 times. When it comes to bodybuilding, his name is always at the top of the list. He made himself even more famous to the world when he went to Hollywood and become an actor. It was the movie, Conan the Barbarian that was filmed in 1982 that made him famous. Arnold then starred in many successful movies including the famous Terminator, True Lies, Predator, Total Recall, and much, much more. At this point, most people would have chosen to retire with all the money and fame and to enjoy life, but not Arnold. He went into politics and was elected in 2006 as the governor of California. Arnold Schwarzenegger was nicknamed “the Austrian Oak” in his bodybuilding days, “Arnie” during his acting career, and “The Governator” (a portmanteau of “Governor” and “Terminator”) during his political career. You can learn more about Arnold’s achievements and biography from Wikipedia. The point is that Arnold has been through a lot in his career and life. He has gone through many ups and downs in his life, but despite all the hardships, he still managed to rise and make his mark in the bodybuilding, acting, and also political career. If Arnold is one of your models of success, you should read his inspiring autobiography, Total Recall. I bought the book many years ago, read it, and was absolutely amazed and inspired by him. In fact, not just me, many were inspired by Arnold too. And I believe that if you are reading this, you are the same, are inspired by this extraordinary man. This is why I decided to write an article about Arnold Schwarzenegger’s quotes because they are inspiring, motivating, and absolutely life-changing. Go through these 17 quotes and let Arnold’s words inspire you. More importantly, reflect and relate these quotes to your circumstances and your life. And if they spark your motivation and inspired you, great, it’s time to get to work and make your dreams come true, like Arnold did. Many people thought that failure is the opposite of success, but in fact, failure is one the same side with success. 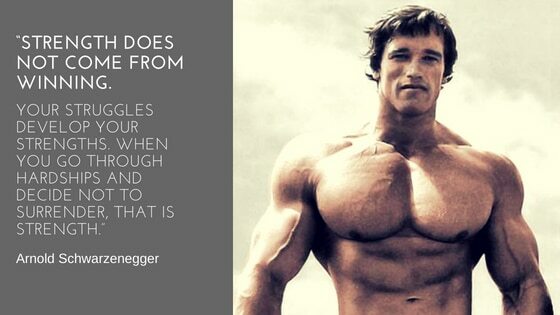 Like what Arnold said, your struggles and your failures develop your strengths. It is when you go through hardships, setbacks, and decide to continue to move on, that is what develops your strengths. Therefore, becoming more successful has nothing much to do with winning, it is about how you manage to bounce back and not give up when you fall. Stop being like everybody else. If you are trying to be like everyone else, you are not living to your full potential. Your journey to becoming extraordinary requires you to be different, to be unique, and to dare to do things according to your own terms and views. When you study the success stories of great people like Arnold, Elon Musk, Steve Jobs, Warren Buffett, and sports athletes like Kobe Bryant, you will notice that these people are the ones who dare to dream and do things differently. They don’t follow the crowd and be like everyone else. Instead, they choose to follow their dreams and their hearts. This is exactly what you need to do to be extraordinary. You must dare to be different, my friend. Do you know the difference between someone who is successful and someone who is not? The difference is their level of commitment. People who want to be successful or wish to be successful will do what is convenient. Whenever things are easy, they will do it. However, when things become difficult or when they face tough times, they choose to quit and give up. On the other hand, successful people who are absolutely committed will choose to do whatever it takes to get the results they want. They are willing to go the extra miles and are committed to doing whatever it takes to achieve their goals, even when times are tough. This is the difference between someone who is successful and someone who is not. Success is not easy, but it doesn’t mean that it is not achievable. But in order to achieve great success in what you do, you must be willing to raise your level of commitment. 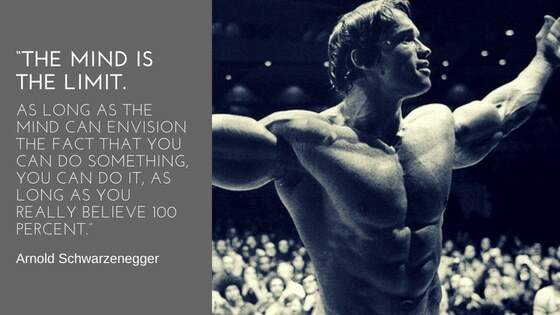 Arnold is right, the mind is the limit. Think about it, when you go for running, who is the one that tells you that you are too tired and you should stop? Your mind did. It is your inner voice that tells you to stop, to not do it, to do something else, and to procrastinate. Hence, you must learn to conquer the mind. It is your mind that tells you to stop. It is your mind that tells you that it is impossible. It is your mind that tells you that you can’t. And it is your mind that you are where you are right now. Change your mindset and you will change your action. And when you change your action, you will live a different life. When Arnold decided that he wanted to build a successful bodybuilding career, many people laugh at him. And he proved them all wrong. When he wanted to venture into the filming industry, many people told him that it was impossible for him because his body was too bulky and his name was too difficult to pronounce. Yet again, he proved them all wrong. 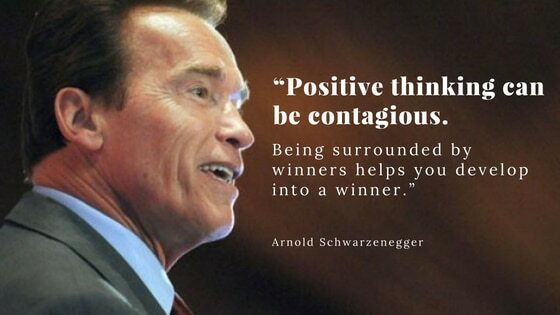 So learn from Arnold. You too can turn your dreams into reality if you are willing to give 100% and never stop believing in your dreams. People give up because they fail to see the possibility of achieving their dreams. They quit when they stop believing that they can achieve what they want. So don’t stop believing in yourself and your dreams. It takes a lot of hard work to achieve outstanding success in what you do. Regardless of whether you want to build a successful internet business or to become successful in your career, you must put in the hard work. Be absolutely dedicated and put in extraordinary effort to train yourself, to improve yourself, and to get better. Why do you think people like Michael Jordan and Kobe Bryant are the best at basketball? They are the ones who are willing to put in the real, hard work. The same goes if you want to build an online business or run a successful blog, you must be willing to put in the work. So be willing to put in the extra effort and hard work. That’s how you separate yourself from the ordinary. Repetition is the mother of all skills. Of course, the concept of deliberate practice is still important, but you need to know that without practice and repetition, there is no point to talk about deliberate practice. You can be good at what you do, but you must be willing to do the hard work, to learn and to practice. “When I’m in writing mode for a novel, I get up at four a.m. and work for five to six hours. In the afternoon, I run for ten kilometers or swim for fifteen hundred meters (or do both), then I read a bit and listen to some music. I go to bed at nine p.m. The only way to become great at what you do is to practice. Arnold did the same. He trained and built his body every day. He put in the reps and mileage. And eventually, he became the best. If you want results, just put in the time and effort. Without your dedication and sacrifice, don’t ever expect results to come to you accidentally. A lot of people are waiting for the right time to come before they act, but sadly, the time will never be right. Just take action and do it. And if you are always looking for the perfect opportunities, guess what, you will never find one because everything can be the next big thing if you are willing to put in the time and effort to grow it. Take a look at all the businesses across all the industries. It is not about what business or which industry should you venture into. Every industry has market leaders. If you are willing to invest time and pour in the hard work, you too can build a super successful business in any industry. So commit yourself to do your best and aim to become the top 10% in your field. Every business and every industry can be profitable, if you are able to make it to the top. One of the most powerful things you can do is to dream big and bold. Not only thinking big inspires you, thinking big also help you achieve better results. When you go for archery, before you shoot the arrow, do you aim higher or do you aim lower? The answer is obvious, you aim higher so that the arrow can hit the bull’s eye. Guess what will happen if you aim lower? You will hit the ground. This is why we must think big and dream even bigger. So that even when we fail, we still manage to produce results better than if we aim lower. And this saying is absolutely right. If you want to be successful, mix with other successful people. Stop mixing with others who complain, blame or think negatively. Identify the top players in your industry and make effort to get to know them. Make friends with them and learn how they think and understand their beliefs. Let their positive energy affect and inspire you to achieve greater success. When I was in real estate, most of the people in my contacts have something to do with real estate. Now that I want to build a successful internet business, so I make the effort to get to know more about other successful internet marketers and make friends with them. You become what you think about most of the time, and what you think about most of the time are greatly affected by the people you spend the most time with. If you want to be successful, you have to work. As simple as that. There is no free lunch in this world. If you want something, you have to pursue it, work on it, and take action. Don’t just wait and keep your hands in the pockets. How do you climb a ladder with your hands in the pockets anyway. Regardless of whether it is man or woman, those who achieve the incredible results in life are those who ignore the limits. And your limits on exist in your mind. The moment you think that something is possible, you are giving yourself opportunities to try it. On the other hand, when you don’t think it is possible, you are creating the limit in your mind. And this closes your mind from even coming up with a way to achieve it because you don’t believe that it is possible. So break the barrier by ignoring the limits. You don’t stop when you are tired. You stop when you are done. Be a finisher and not a starter. There is no point to keep starting a new business or a new project if the previous one is not finished. Think about it, having a book fully written is more powerful than having 10 books half-written. The fully written book has a bigger impact on your life than those half-finish projects. Thus, focus on getting things done. Identify your most important goal and focus all your energy there. Get the things done and work your best to achieve your goal. If you are giving yourself these excuses, grow up. 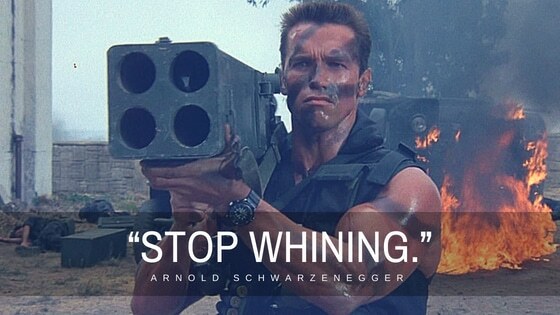 Stop whining because you are not a baby. You are a grown-up, so learn to tackle the problem. Nobody says that success is going to be easy. If it is easy, everyone would have done it. But the problem is that most people whine and give lousy excuses that stop them from reaching their full potential. Hence, don’t whine. Tackle your problems like a grown-up man. If you don’t know how to build a website, learn. If you don’t know how to drive traffic to your blog, learn and take action. If you don’t know how to make sales from the traffic, learn and implement a sales strategy. If you don’t know how to do something, learn and then take action. The moment you stop and whine, you are giving away the power to control. Instead, take charge of your life and start making progress. Yes, the first step to making your dreams a reality is to identify your dreams. You have to know what you want, see it in your mind vividly, and then work on it. The majority doesn’t even know what exactly do they want out of their lives. When you ask people what they want, most of them will tell you that they want a better career, they want to be rich, they want to be happy, they want to be debt free, etc. But these are so general and vague. You must make your vision as real as possible. Envision yourself living your dreams. And this will spark the drive and the motivation within you to achieve it. If you don’t have a vision, how do you know what you are building? When you build something, you need a blueprint. Without the blueprint, there is no way you can tell what is your next step. With a blueprint, you know exactly what to do, where to lay the bricks, how the walls look like, and how the finished product looks like. Most people don’t have a blueprint and they don’t have a vision. So dream up the future you want. And then work on to create it. Life is going to be unfair and your journey may not be as smooth as you imagine. But that’s okay because that’s how life’s supposed to be. So hustle, my friend. Work on it and bring it on. Have the courage and the strength to go through hardships. Learn to build your characters as you go through all the setbacks. Mistakes and failures make you a better person. So endure and hustle through it. Kelly Clarkson sings it, “What doesn’t kill you makes you stronger”. So don’t be afraid of hardships and resistance. For they are the keys to growth. In fact, achieving greatness and success is not about getting the results, it is about becoming the better person. It is about the journey that builds your characters. This is why people often say, success is not a destination, but a journey. When you go through the tough times, learn the lessons, improve, get better, and build stronger characters, these are the things that level you up and make success possible. It’s like the caterpillar undergoes the metamorphosis process. The process is difficult, but after the caterpillar successful endures the hardships, it finally becomes a beautiful butterfly. The same goes for you and me. Want to be a beautiful butterfly (successful)? Then you have to go through metamorphosis in life. In my opinion, these are the 17 most amazing and motivational quotes you can learn from Arnold Schwarzenegger. Which is the quote that you think is most inspirational to you? Or do you have something even better from Arnold? Do share it with me in the comment section below.